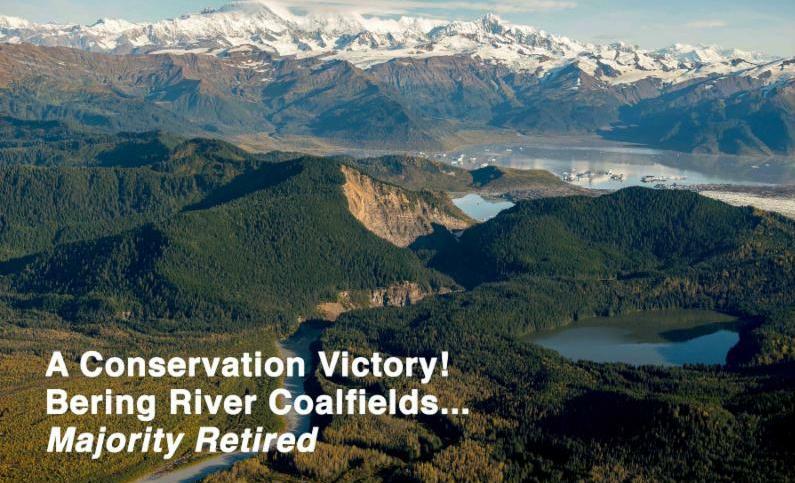 We are excited to share in a conservation victory that the Eyak Preservation Council has been working on for 20 years that will bring long term benefit for the wild salmon habitat, for the Cordova and Copper River communities and for the Indigenous people not only in this region, but all over Prince William Sound! The preservation of wild salmon habitat is integral to EPC's mission, and one of the largest obstacles has been a coal-rich historic coalfield in the Copper, Bering and Martin River watersheds. It is the 73,000-acre surface and subsurface private inholding owned by the Native corporation: the Chugach Alaska Corporation (CAC). 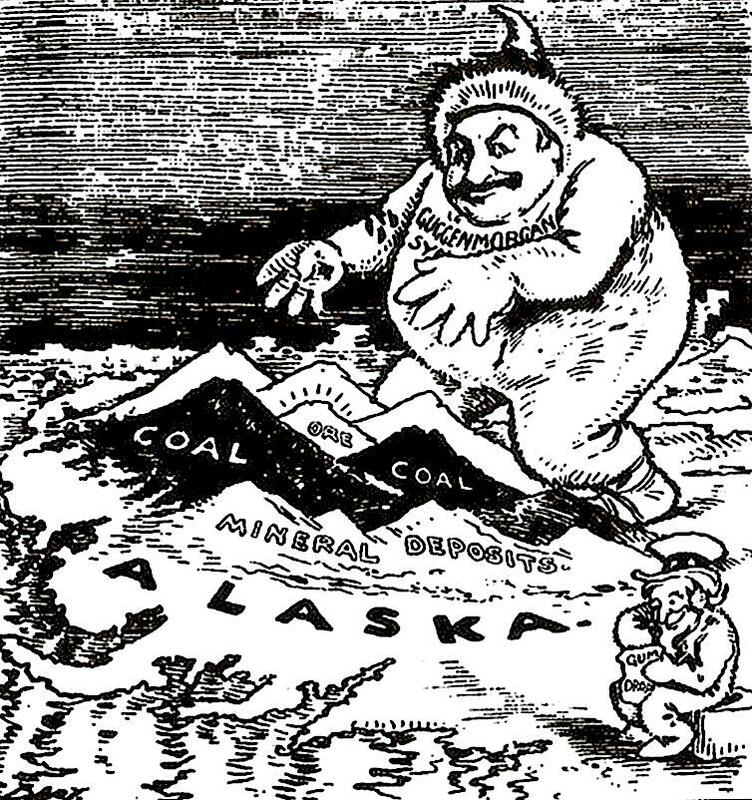 1906 Bering River coalfields cartoon when President Roosevelt enlarged the Chugach National Forest to prevent mining. The Bering River coalfields have a long history. President Theodore Roosevelt first conserved them for all posterity, so he thought, in 1906. Then they were chosen for mining and development in CAC's Alaska Native Claims Settlement process in 1971. EPC and these coalfields also have a long history. EPC has been working to retire them in the name of conservation since the mid-1990's. We organized a non-violent action in '98 to stop the first effort to build a road across the Copper River Delta to the coalfields. We succeeded. The surface lands and waters are now conserved as part of a carbon offset trade. The shareholders of the Chugach Alaska Corporation will be paid to leave their trees standing, and to keep the Bering River coal in the ground. The Native Conservancy land trust holds the conservation easement to 62,000-acre CAC coal title, so for the first time in 105 years the Indigenous people are stewards and protectors of their ancestral lands. EPC and its founder, Dune Lankard, founded the Native Conservancy in 2003 with hopes that someday it would be the holder of the coal title with restrictive covenants for conservation. This has finally happened - Bering Coalfields Retired. EPC is thrilled, and we are reaching out to thank you, and to share with much appreciation for this precedent setting conservation victory. 11,000-acres of bituminous coal to still needs to be purchased and retired! This is owned by a private corporation in South Korea: the Korea Alaska Development Corporation. The owner is still a willing seller for conservation, so the right buyer(s) needs to be found ASAP! We are very concerned and focused on reaching out and retiring this bituminous coal title. It is still a viable option for mountaintop mining in one of the wildest and largest wetlands complexes in the world. We say let's keep ALL this coal in the ground. Become part of the Bering coalition that makes an Investment in Forever. Despite many requests to move their planned time amid concerns of negative impacts to fisheries and communities the U.S. Navy has doubled down on its planned training exercise, known as "Northern Edge", currently planned for May 2019. Alaska's coastal communities are united in this effort but we still need your help.